Posted on December 28, 2017 at 12:09 pm. Celebrate the last Friday of 2017 and kick off the New Year with Mucho Vegas Casino’s Taco Fridays bonus, which grants registered members a 30% match bonus up to $/€300. This offer can be claimed every Friday at MuchoVegas.com, just by making a real money deposit of at least €/$25 (250 SEK/NOK/ZAR) at the site. The casino will automatically match whatever amount you deposit up to the maximum allocated ($/€300) and credit your account once the deposit has been successfully processed, giving you an easy boost to your account balance. 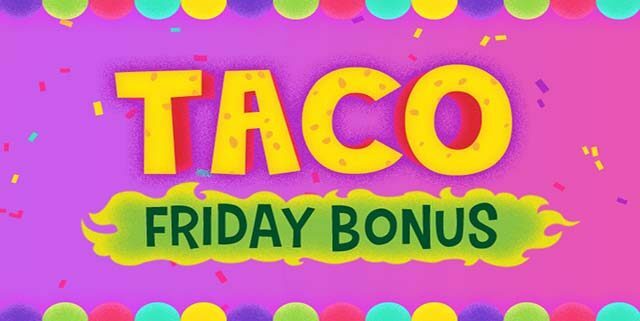 Because Taco Fridays at Mucho Vegas is ongoing, you can take advantage of this offer every week at your pleasure, in addition to the many other ongoing and special promotions the site has, such as Free Spins Mondays and Mucho’s Midweek Reload Bonus. Mucho Vegas has one of the best software catalogues in the industry, with hundreds of online pokies games from some of the best game creators in the world, including 1×2 Gaming, BetSoft and iSoftBet. Because Mucho is an instant play, no download casino site, you can access and play all of its games on computer or mobile devices fast and easy – without the need to download any software. Like with all casino promotions, claiming the Mucho Vegas Taco Fridays bonus comes with terms and conditions players must be aware of before claiming. The bonus and deposit amounts are subject to a 30x wagering requirement before you can withdraw any money from your account balance. Players can only claim the Taco Fridays match bonus once per week. Players cannot combine this offer with any other match bonuses or promotional offerings. Players must select the bonus while they are in the banking section making the deposit. As already stated, the minimum deposit required to be eligible for the bonus is €/$25 (250 SEK/NOK/ZAR). If you are unfamiliar with how wagering requirements, also called rollover rates or playthrough requirements, work at online casinos, please read our detailed wagering requirements guide. Online pokies games contribute 100% towards fulfilling the bonus wagering requirements, with some exceptions: Castle Builder II, Bloodsuckers, Devil’s Delight, Kings of Chicago, Lucky3, Pirates Gold, Retro Reels, Simsalabim, Zombies, Lucky Swing, Space Traveller, Trucker’s Heaven, Crazy Jungle, Diamonds Are Forever, Scrooge, The Angler and Gold Train are excluded from contributions to the 30x rollover rate. Live dealer casino games, table games, video poker and all other games on the site contribute 10% towards the wagering requirements. Mucho Vegas states the bonus amounts and terms may vary depending on the country of residence of the player, and that their management reserves the right to change bonus terms at any time without notice. As with all online casino site promotions, we highly recommend all of our readers visit the Mucho Vegas and read the full terms and conditions of this offer before making any real money deposit. Who can play at Mucho Vegas Casino? Unfortunately, players from the following countries and regions cannot claim this offer as they are restricted from signing up for an account and playing at Mucho Vegas: United States of America, Us Minor Outlying Islands, US Virgin Islands, Canada, United Kingdom, France, Italy, Slovenia, Czech Republic, Spain, Switzerland, Netherlands, Malta, Panama, Costa Rica, Curacao. If you are from United States and are looking for alternatives to Mucho Vegas Casino, our top recommended online casino site for your region is Raging Bull Casino thanks to its similarly generous ongoing promotions, welcome bonus incentives, and hundreds of real money pokies and table games instantly available with the click or tap of a button. How can I sign up at Mucho Vegas? Thinking of signing up to Mucho Vegas? You should read our review on Mucho Vegas here for more information on its bonuses, competitions, games, deposit options, promotions and our overall verdict on what type of pokies/slots players the site best suits. If you sign up to MuchoVegas.com via our links, you can claim up to €/$1,500 (or currency equivalent) and 150 free spins, spread out across your first seven real money deposits at the site.